It is likely that the motte and bailey castle at Kilkhampton was built in between 1066 and the end of the 12th century AD. It is likely that the motte and bailey castle at Kilkhampton was built in between 1066 and the end of the 12th century AD. No documentation is available relating directly to the castle, so a more exact date is not possible ( b1). 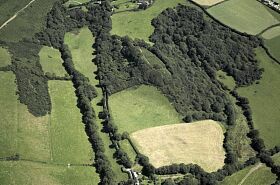 The site now exists as a series of earthworks, apart from some footings remaining on the motte. It is sited on top of an elongated knoll, from which the ground falls very steeply to deep valleys on the north and south, and is approached by a narrow neck of land from the east. 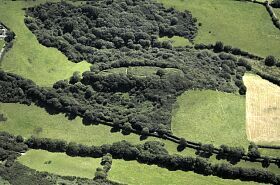 The castle consists of a motte with two baileys: one of two known examples in Cornwall (the other being East Leigh Berries, PRN 87). The oval motte is situated at the western end of the castle. It is 18m in length east to west, and 8m from north to south. A V-shaped ditch below the motte separates it from the inner bailey. The inner bailey is rectangular and measures 30m east to west, and 25m north to south. The outer bailey, separated from the inner by a V-shaped ditch, is of a trapezoidal form: 24m east to west; 20m north to south; 14m north to south-east. The castle is visible on aerial photographs (p1) and was plotted as part of the NMP. Preston-Jones, A, 1988, Kilkhampton Castle (Cornwall Event Report). SCO1791. Preston-Jones, A, 1997, The Scheduled Management Project: Kilkhampton Castle (Cornish Archaeology 39/40, 2000-01), CA 39/40, 185-6 (Article in serial). SCO1813. 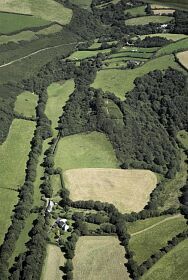 Reynolds, A, 1999, Kilkhampton Castle Farm: An Archaeological and Historical Assessment (Cornwall Event Report). SCO1941. <p1> NMR, 1999, NMR/18504/33 (Photographic Record). SCO18804. --- SCO1791 - Cornwall Event Report: Preston-Jones, A. 1988. Kilkhampton Castle. --- SCO1813 - Article in serial: Preston-Jones, A. 1997. The Scheduled Management Project: Kilkhampton Castle (Cornish Archaeology 39/40, 2000-01). CA 39/40, 185-6. --- SCO1941 - Cornwall Event Report: Reynolds, A. 1999. Kilkhampton Castle Farm: An Archaeological and Historical Assessment. [p1] SCO18804 - Photographic Record: NMR. 1999. NMR/18504/33. ABP.